Of all the instances in which graphic communication is necessary to transcend language barriers, the Olympic Games are, if not the most important, probably the most visible. We take the little icons of swimmers and sprinters as a given aspect of Olympic design, but the pictograms were a mid-20th Century invention—first employed, in fact, the last time London hosted the games, in 1948 (some pictographic gestures were made at the 1936 Berlin games, though their mark on international memory has been permitted to fade because of their association with Third Reich ideology). The 1948 London pictograms were not a system of communication so much as a series of illustrations depicting each of the competitive sports, as well as the arts competition, which existed from 1912 to 1952 and included architecture, literature, music, painting and sculpture. 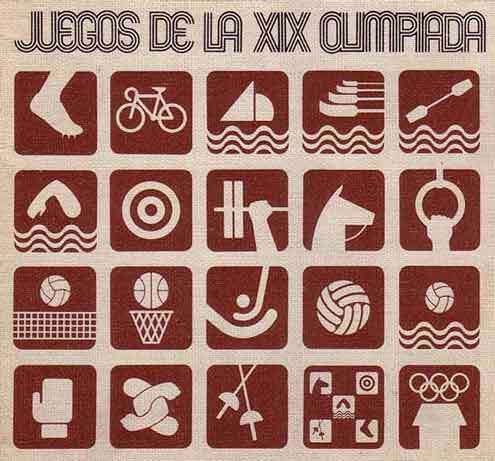 In 1964, the Tokyo games took pictogram design to the next level by creating a complete system of typography, colors and symbols that would be applied across Olympic communications platforms. Since Japan had not adopted the principles of the International Traﬃc Signs, introduced at the United Nations Geneva conference in 1949 and accepted by most European countries, the Olympics were regarded by graphic designers as an opportunity to establish a more uniﬁed and internationally legible symbolic language across the country. It was along these lines, searching for universally understood visual languages, that pictograms (ekotoba, in Japanese, a word used prior to the design of pictograms) were for the ﬁrst time designed for the Olympic Games, embodying at the same time [founder of the International Olympic Committee] Baron deCoubertinʼs aspirations of universalism. Think of it as TV’s Comic-Cannes. Since its inception 42 years ago, Comic-Con International has been a celebration of fanboy culture. When geek became the new cool, it also worked as a marketing platform for Hollywood and video game makers. Now, it’s the place where the television industry comes to build buzz for new shows and reward the audiences of established ones. More than 80 television series courted the crowds at Comic-Con last year with premieres, panels and promotional events. This year in San Diego, the numbers are just as high – and the visibility even greater. Timing has something to do with it; the dates of Comic-Con make it a perfect place to preview fall shows. Corralling the talent is also a breeze – television has no Sundance or Cannes, making Comic-Con one of the few places on the planet where a television writer is treated like a rock star by screaming thousands. The most extensive listing of free online education I have ever seen. Bookmarking for later. All education is self-education. Period. It doesn’t matter if you’re sitting in a college classroom or a coffee shop. We don’t learn anything we don’t want to learn. Broken down by subject and/or category, here are several top-notch self-education resources I have bookmarked online over the past few years.